Winter may not seem to the most popular season for having your wedding in a marquee but there is still huge potential for a truly memorable big day. If planned correctly your ceremony and reception will be a magical experience for all involved, no matter what the weather may throw at you. It doesn’t matter if there’s rain, snow or sun – with the tips below you’ll be fully prepared for whatever is in store, outdoors or undercover. Fairy lights are a staple for winter weddings and they help to create a cosy ambience, but it’s worth thinking about where you’re going to have your photographs taken and making sure the area is properly lit too. We have a range of indoor and outdoors lights that can help set the mood for any aspect of your big day. Think festoon walkways, fairy light ceilings and coloured flood lights bringing your venue to life. The weather is unpredictable at the best of times but when it gets cold in the winter, it gets really cold. Always assume that things will get chilly and plan some fun ways to keep your guests warm – heart-shaped hand warmers and a hot chocolate bar are just a couple of fun touches you can add. If any part of your ceremony takes place outside, even if it’s just walking to the marquee, make sure umbrellas are on hand for your guests. Of course once inside then that’s where we step in. We have the latest indirect heaters available to hire, so all you have to do is set the thermostat and enjoy your evening. If things are a bit chilly outside then you might be looking for a way to defrost yourself. Whatever drink you intend to serve to your guests, we have a huge range of glassware available for you to choose from. So whether you need jugs for mulled wine or some Irish coffee glasses, we have it. Winter weddings may be associated with muted colours such as whites and greys but we think it’s great to to add reds, pinks, and greens to brighten things up a bit. Reds and greens may be considered too festive but when done right they can look elegant and stylish. If this is something you are interested in then please contact us about our range of coloured linen, marquee linings and seat pads. Most importantly you need to embrace what the season has to offer. Festive doesn’t have to be tacky and by adding some trademark wintry touches, you can create an atmosphere that wouldn’t be possible or appropriate at other times of the year. The closer you get to Christmas the more festive you can go by perhaps putting Christmas trees and candy canes on your tables. When it comes to flowers your choices may be more limited but branches and pine cones make equally good centrepieces and decorations. If you really want to impress your guests enquire about our moving led lights and gobo projectors. If you want snowflakes projected across your marquee we can do it. These are just a few ways you can make your wedding a romantic winter wonderland, whether you hold it indoors or out. 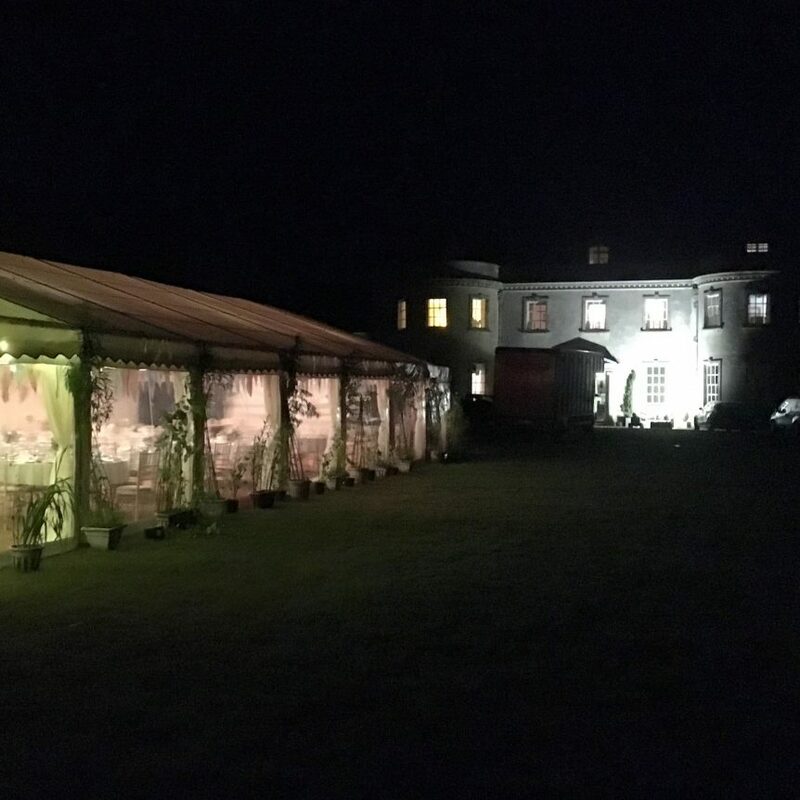 When it comes to preparing your marquee our friendly team, experienced at planning marquees for winter weddings, will be on hand to help you create the big day of your dreams.